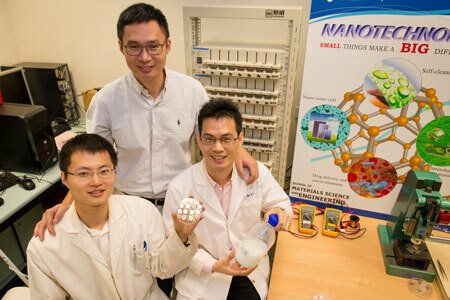 (Nanowerk News) Scientists from Nanyang Technological University (NTU Singapore) have developed a new battery that can be recharged up to 70 per cent in only 2 minutes. The battery will also have a longer lifespan of over 20 years. Expected to be the next big thing in battery technology, this breakthrough has a wide-ranging impact on many industries, especially for electric vehicles which are currently inhibited by long recharge times of over 4 hours and the limited lifespan of batteries. This next generation of lithium-ion batteries will enable electric vehicles to charge 20 times faster than the current technology. With it, electric vehicles will also be able to do away with frequent battery replacements. The new battery will be able to endure more than 10,000 charging cycles – 20 times more than the current 500 cycles of today’s batteries. NTU Singapore's scientists replaced the traditional graphite used for the anode (negative pole) in lithium-ion batteries with a new gel material made from titanium dioxide, an abundant, cheap and safe material found in soil. It is commonly used as a food additive or in sunscreen lotions to absorb harmful ultraviolet rays. Naturally found in a spherical shape, NTU Singapore developed a simple method to turn titanium dioxide particles into tiny nanotubes that are a thousand times thinner than the diameter of a human hair. NTU Assoc Prof Chen Xiaodong with research fellow Tang Yuxin and PhD student Deng Jiyang. This nanostructure is what helps to speeds up the chemical reactions taking place in the new battery, allowing for superfast charging. Invented by Associate Professor Chen Xiaodong from the School of Materials Science and Engineering at NTU Singapore, the science behind the formation of the new titanium dioxide gel was published in the latest issue of Advanced Materials ("Nanotubes: Mechanical Force-Driven Growth of Elongated Bending TiO2-based Nanotubular Materials for Ultrafast Rechargeable Lithium Ion Batteries"). NTU professor Rachid Yazami, who was the co-inventor of the lithium-graphite anode 34 years ago that is used in most lithium-ion batteries today, said Prof Chen’s invention is the next big leap in battery technology. “While the cost of lithium-ion batteries has been significantly reduced and its performance improved since Sony commercialised it in 1991, the market is fast expanding towards new applications in electric mobility and energy storage,” said Prof Yazami. Prof Yazami, who is Prof Chen’s colleague at NTU Singapore, is not part of this research project and is currently developing new types of batteries for electric vehicle applications at the Energy Research Institute at NTU ([email protected]). Moving forward, Prof Chen’s research team will be applying for a Proof-of-Concept grant to build a large-scale battery prototype. The patented technology has already attracted interest from the industry. The technology is currently being licensed to a company and Prof Chen expects that the new generation of fast-charging batteries will hit the market in two years' time. It holds a lot of potential in overcoming the longstanding power issues related to electro-mobility. “With our nanotechnology, electric cars would be able to increase their range dramatically with just five minutes of charging, which is on par with the time needed to pump petrol for current cars,” added Prof Chen. The long-life of the new battery also means drivers save on the cost of a battery replacement, which could cost over USD$5,000 each. However, Prof Chen’s new cross-linked titanium dioxide nanotube-based electrodes eliminate the need for these additives and can pack more energy into the same amount of space. This battery research project took the team of four NTU Singapore scientists three years to complete and is funded by Singapore's National Research Foundation. NTU Singapore is a young, research-intensive Asian university that is ranked No. 1 in the world in this year's QS Top 50 Under 50 rankings, a global league table of young universities 50 years old and below. It has an established track record for working with industry. In the 2013 and 2014 Times Higher Education World University Rankings 2014, NTU Singapore was ranked joint No. 1 globally for industry income and innovation with a few other universities. NTU Singapore is also one of the biggest risers in the latest Times Higher Education World University Rankings, leaping 15 notches this year to 61st position. It has moved up the prestigious league table a total of 108 places in the last three years, making it the best performer in the top 200 in recent times.